No one was ever prosecuted in El Salvador for the assassination of Oscar Romero. A homicide case was initially opened, but the first judge was threatened and fled the country and subsequently the case proceeded only by fits and starts over the following years. 121. The sluggish pace of justice was not spontaneous. In this case it came about as the result of strategic and concerted actions that kept the Supreme Court of Justice, the Office of the Public Prosecutor of the Republic, and the Courts from acting impartially and seeking a fair trial with due process guarantees. The online periodical El Faro has obtained access to the original court file for the Romero assassination and has photographed much of the evidence in the file, making it available today on the El Faro website. Included in those photos are bullet fragments from the explosive .22 caliber bullet which took Romero's life, the witness statement of Amadeo Antonio Garay Reyes, who testified to his role as a driver for the assassination team, and photocopied pages of the "Saravia Diary" which contain notes of Captain Alvaro Saravia, following orders from Roberto D'Aubuisson in planning and carrying out the murder. In 2017, after the 1993 amnesty law was overturned, a judge in San Salvador ordered that the Romero assassination case should be reopened. These court documents displayed by El Faro are the old court file; we have yet to see any indication that the current judge and attorney general will move the case forward and add to that file. UPDATE: On October 10, the attorney general of El Salvador, Douglas Melendez stated that in the next days or weeks it is possible that there would be new steps taken in the Romero assassination case. 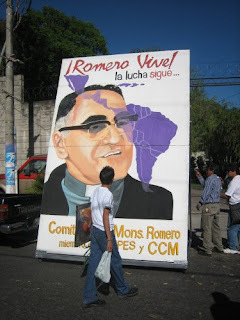 As Romero's canonization on October 14 approaches, El Faro has published this week a special section of its coverage of Romero over the years, including narrative account of the final days of Romero leading up to his martyrdom in the Divina Providencia Chapel. You can read it (in Spanish) here, accompanied by the now famous photos taken by a photographer who was in the chapel that evening.